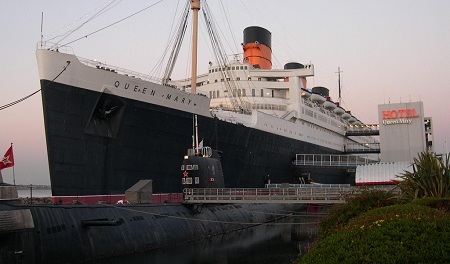 On March 12 2013, Cunard Line’s Queen Elizabeth and the legendary Queen Mary will make history when they meet for the first time in a Cunard Royal Rendezvous in Long Beach Harbor. This rare evening encounter will be open to the public and will feature traditional whistle salutes between the ships and conclude with a fireworks display. The elegant Queen Elizabeth captured the world stage in 2010 when she was christened in a Royal Naming Ceremony by Her Majesty The Queen in Southampton, England, amongst more than 1,500 guests, celebrities and dignitaries. 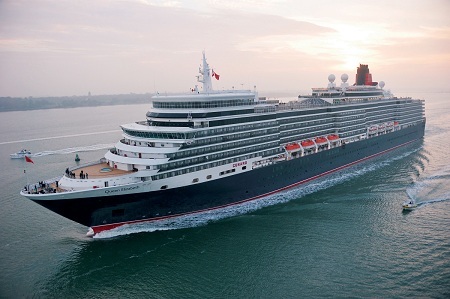 The youngest in Cunard Line’s fleet, Queen Elizabeth recalls the rich heritage of the first Cunarder to bear the name, and features many unique Cunard traditions linking her with her sister ships and their predecessors, together with all the modern day luxuries Cunard guests have come to expect. The ship’s adherence to liner traditions is most evident through art deco touches, elegant double- and triple-height public rooms on a grand scale, luxuriously endowed with rich wood paneling, intricate mosaics, hand-woven carpets, gleaming chandeliers and cool marbles. In addition, Queen Elizabeth reintroduced The Verandah Restaurant which was first conceived on the Queen Mary and pays homage to her predecessor with replicas of the legendary ship’s artwork. Earlier in the day, Queen Elizabeth will have returned from a 36-day roundtrip voyage from Los Angeles through New Zealand, and departs on the 12th at 5:00pm en route to New York via the Panama Canal.